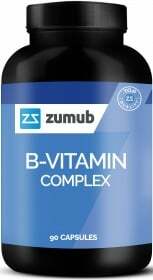 Zumub B-Vitamin Complex provides the all-round support associated with sufficient intake of B Vitamins. This complete and safe supplement is a comprehensive promoter of your wellbeing. The lack of essential vitamins can negatively influence the normal functioning of your body. Zumub B-Vitamin Complex provides 100% or even more of the daily value of each vitamin. All these benefits make Zumub B-Vitamin Complex a ‘massive weapon’ that targets at more than one beneficial effect and is created to let you experience the joy of feeling well. Have a question about B-Vitamin Complex? What is it, what does it do, how and when to use or something else? Ask us. As a supplement, take 1 capsule a day, preferably with a meal, or as suggested by a healthcare professional. WARNINGS B-Vitamin Complex : Do not exceed recommended dosage. Keep out of reach of children. This product should not be used as a substitute for a varied and balanced diet & healthy lifestyle. This product should not be used in case of hypersensitivity or allergy to any of its constituents. Store in a cool, dry place. BEST BEFORE: Please see lot number and expiration date stamped on the packaging.